The hill from the employee parking lot to the building where I work is gigantic. It is long, steep, and, especially when it’s cold outside, the prospect of walking up to work is daunting. Most days I am spoiled because Brennan drops me off at the entrance and then goes to park the van; but, on days when our schedules do not match, I am left to climb the mountain. And I don’t want to do it most days. The challenge is half psychological and half physical. I’m not in great shape – yet – so that’s part of it. But, when I look at the hill I also have to convince my brain that I can do it because it feels like I will never make it, like I will fail. What I have found is this: if I focus on my feet and on taking one step at a time instead of looking up to the top of the hill, it is far less challenging. If I take it one step at a time, it’s not that bad! I make it to the top of the hill, a little out of breath, but I can do it. I succeed. This analogy is a perfect one for our lives right now: we’re nearing the one year anniversary of Tori’s heaven-going; some days it seems like our hearts will never fully heal, that it will be forever before we are reunited with her again. We long to hold our baby girl and gaze into her beautiful eyes once more, and that time (and heaven) seems so far away. But, when we take the journey one step at a time, focusing on the Lord and on one task at a time, it’s so much easier and we feel refreshed. We don’t feel overwhelmed or tired. We feel at peace and we know that we can take the next step. Why is it so hard to remember to do this? Whatever your mountain might be today, focus on the next step, not on the entire climb. Allow the Lord to guide you and sustain you; He is faithful and will lead you well. When I was given the opportunity to review this book, I jumped at the chance, and I’m so glad that I did. You Carried Me by Melissa Ohden is the incredible story of an abortion survivor and her quest to find answers. 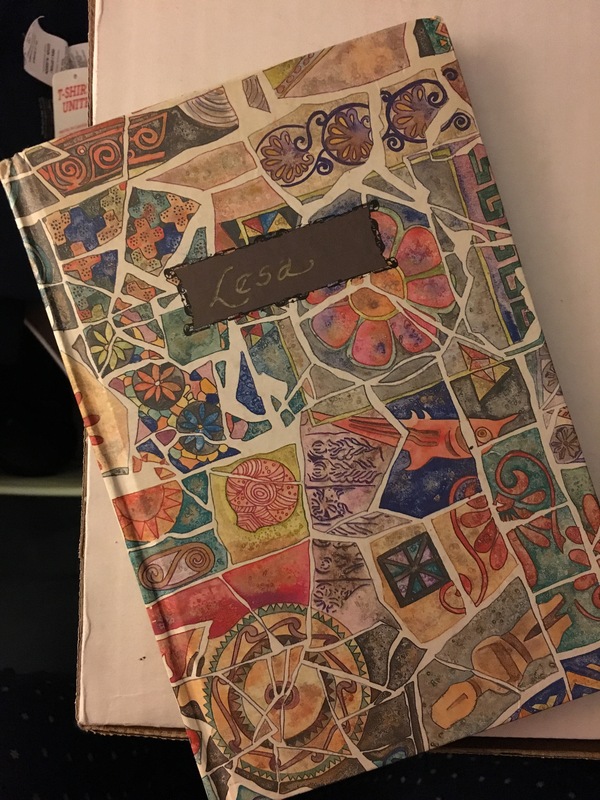 She learned about her almost-tragic beginning from her adoptive family and she writes openly and honestly about how she processed this information and how she has used it to encourage other women along the way. You can see an interview with her here. I read the entire book in one sitting because I was so drawn in and touched by her life. I highly encourage you to pick up a copy and read it – AND, share it with someone who might need the encouragement that this book provides. I received a review copy of this book from the publisher; all opinions are my own. It’s hard to believe that it’s October already. September was a blur, filled with many changes and hardly any free time. Now it’s Fall and the temperatures have cooled, the leaves are starting to change, and we are in a season of waiting and expectation. My job has been going well, but they’ve been putting me on the schedule for far more hours than I had requested, leaving me feeling exhausted and with little time at home. Between working five days a week (as opposed to the requested 2-3 max) at The Hotel and one day a week at church, I’ve been left with only Sundays off consistently, and I’m hoping that changes soon. I haven’t had much time to write, read, or rest, and I feel weary. In addition to working so much, we had to say goodbye to Brennan’s car last week, leaving us with only one vehicle for the foreseeable future. This means many hours of sitting at The Hotel for one of us when our shifts don’t coincide (all too often). Now one of the windows on the van isn’t working properly and we’ll have to have that fixed soon. Money is tight, we each have our own minor physical struggles (ear infections for me, leg injury for Brennan), we’re too busy (and that is out of our control), we miss Tori, and we’re tired. It’s so easy to feel discouraged right now. Tori has been in Heaven for six months and it’s amazing how easily it is for us to lose perspective already. After all that we’ve been through, all that God has brought us through, it’s still so easy to get wrapped up in all the things that aren’t going our way. We realized this earlier this week and we corrected our perspective – what we’re enduring now is nothing compared to what we went through with Tori, and we can’t let ourselves be overcome by these trials. We can’t allow ourselves to forget that God is holding us in His hands and is in complete control! He is faithful, He is good, and we are trusting Him during this season of waiting and uncertainty. We’ve been working feverishly to get our house ready to be on the market, and that will happen THIS WEEK! We’re so excited! You can read about why we are selling our home here. We cannot wait to be DEBT FREE! We were featured in the Lancaster newspaper yesterday and are so thrilled that Tori is continuing to make waves across the state! My manuscript is being edited THIS MONTH and we hope to start pitching it to publishers in November! I also have another book idea brewing, so I hope to start working on that project soon. We’re headed to California this week for a quick trip to Disneyland! I was supposed to photograph a conference in SoCal and had already purchased my plane tickets when the conference was canceled…so, we decided to go to Disneyland instead! I’m continuing to write for The Transcend Project along with members of our church. Please check it out! There’s SO much great content on there! Also, I finally decided to release the live recording of the song I wrote this year (my first and only!). You can hear it here. Please continue to pray for us as we continue to navigate life without our Tori. We miss her terribly and there isn’t a day that goes by without us thinking about her constantly. We’re still doing well, but life is obviously very different without her. Please pray for wisdom with decisions regarding potential offers on our home and where we will live after the house sells. Please pray for favor with publishers, and that the right one will step up to help us tell Tori’s story and save lives through Newborn Screening. Pray for physical healing for both Brennan and me. Pray for us during this season of “waiting” for so many things – our home, future children, the book, etc. Disclaimer: As with anything I write, I write with the understanding that we all process death and grieving differently – even as believers – and this is not a judgment or a criticism of anyone who handles these things differently. I write about my own beliefs and understanding of death given the hope that Jesus brings to us all, and I write about how this is playing out in my own life in hopes that it might encourage others in their own journeys. I have broken this into three posts because of the length. Stay tuned for part two! My grandfather, Papa Fay, passed away last June after a long battle with Alzheimer’s Disease. He was the first (and only, thus far) grandparent I had lost – something I do not take for granted. His death taught me so much and, though I didn’t recognize it at the time, it prepared me for Tori’s passing nine months later. We watched him decline as the horrible disease overtook his faculties and we prayed for years that the Lord would take him home so that he wouldn’t suffer any longer on this earth. When he went to Heaven on June 10, 2015 he was no longer the man any of us had known and loved – he was merely a shell, a body. His death brought us joy because we knew for certain that he had a relationship with Jesus and that He was now present with the Lord in Heaven. He could visit with people (his favorite thing to do, a joy that the disease robbed from him as time passed), he could walk, sing, dance, and express himself. He was FREE from the chains of Alzheimer’s Disease at last, and we know that we will one day be reunited with him for eternity. What hope and joy that knowledge brings! As we watched Tori decline and saw Krabbe taking a strong hold of her precious little body, this experience with Papa Fay brought me such comfort. She was no longer the baby we once had and her brain was gradually losing the ability to function well. If God wasn’t going to heal her here on earth, we were comforted by the knowledge that He would heal her in Heaven. or sorrow or crying or pain. All these things are gone forever. When we – as followers of Jesus – are living with Eternity in mind, our earthly perspective on death should shift from sorrow to joy. We all know that death is inevitable – Scripture (and life experience) make that clear. And I know you are sending me to my death— the destination of all who live. None of us can hold back our spirit from departing. BUT, we also know that this earth isn’t our home, it isn’t where we belong. Death is NOT the end of our existence. We are only here for a short time, to form a relationship with God and to preach the Gospel to all so that all might be saved through Him. We are here to prepare for eternity. How do you know what your life will be like tomorrow? Your life is like the morning fog—it’s here a little while, then it’s gone. since you don’t know what the day will bring. Since we aren’t going to live on this earth forever, why do we allow ourselves to become so sad when our loved ones who knew Jesus depart for Heaven? I was taught a lesson (a discipline, really) during my senior year of high school that has had a profound impact on my daily life: the discipline of gratitude. A wise woman in my church (named Vicki Allwardt) handpicked a few of us to mentor and disciple; our journey formally began on January 1, 2001 and ended when we all left for college, but I have never forgotten the wisdom that was conveyed. She handed us all journals and asked us to write at least three things each day for which we were thankful. 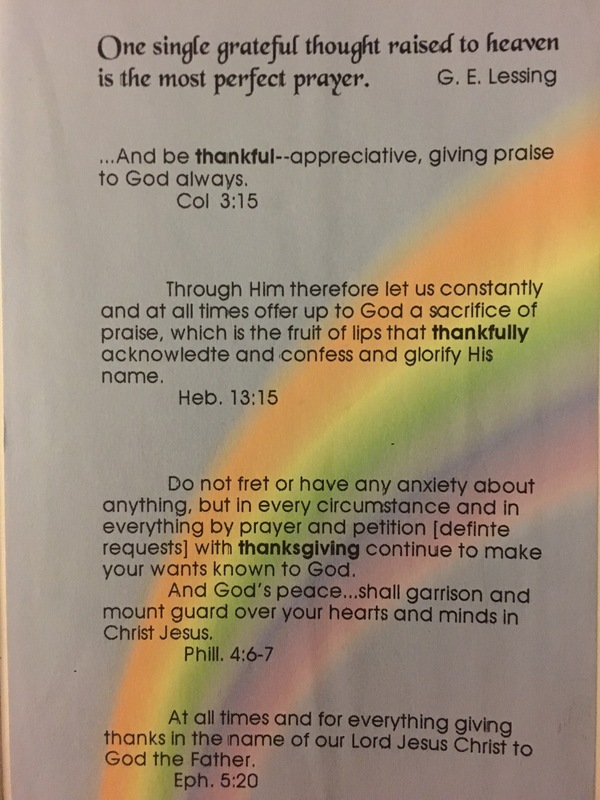 She included verses on colorful paper about thankfulness at the front of the journal. I faithfully wrote in mine that year and sporadically the next. The entries are amusing at first, giving insight into my eighteen year old mind (I was very thankful for boys 😉 ), but a gradual shift can be seen as I fine-tuned this discipline of gratitude. Looking back, it isn’t the specific things for which I was thankful that had an impact: it’s that I was taught to recognize God’s hand in my life in such a simple, yet incredible, discipline. Now, fifteen years later, I am a thankful person most of the time and I don’t even have to purposely try to think of things for which to be thankful. It’s part of who I am. Gratefulness naturally flows out of my heart because I have trained my heart to be thankful in ALL circumstances. This goes beyond optimism. This goes beyond happiness. This is a form of worship because you are continually recognizing God’s presence and His faithfulness all around you. 8 And now, dear brothers and sisters, one final thing. Fix your thoughts on what is true, and honorable, and right, and pure, and lovely, and admirable. Think about things that are excellent and worthy of praise.9 Keep putting into practice all you learned and received from me—everything you heard from me and saw me doing. Then the God of peace will be with you. ALWAYS be joyful. We are commanded to be joy-filled (remember, joy isn’t happiness) at all times, in all circumstances (v.6). Prayer – including thanking God for what He has done – will be followed by God’s peace (v. 7). Focusing on things that are good, true, and pure (in other words, God’s character traits), and continuing to try each day to live as Christ did will bring peace (v.8). Joy + gratitude + Godward focus = peace. As I started to write this post I did some quick research and found a couple of great articles about this discipline, and you can read them here and here. …Practicing gratitude rests soundly in the assuredness that God will ultimately redeem every horrible situation in this life or the next. “He will wipe every tear from their eyes. There will be no more death’ or mourning or crying or pain, for the old order of things has passed away” (Revelation 21:4). We have learned to focus on all the good He did in our lives and in the world through Tori instead of on her earthly absence. We have learned to praise Him for the time we had with her, for the memories we made, rather than all that we won’t experience with her. After all, what good does it do to dwell on the things we cannot change? We are not perfect, we don’t live this out perfectly, and there is certainly nothing wrong with mourning the loss of her and the life she could have lived. We did that frequently while she was with us, mostly in unexpected moments, and I know that we will grieve her absence at times throughout our earthly lives. But, the discipline of gratitude has brought us such peace even in the midst of a parent’s worst nightmare, because we are focused on the truth of who God is – a loving, gracious Father who loves us more than we can fathom, and who works all things for our good. He is a Redeemer, and He will redeem all of this someway, somehow. For now, we thank Him for all that He has done and praise Him for He is worthy to be praised. Six years ago I had the privilege of going to São Paulo, Brazil, to observe and serve alongside missionaries there. One conversation starter they often use is this: Where did you see God this week? It doesn’t require a super-spiritual answer. Wherever you see goodness, joy, grace, kindness, love, peace, etc. (Galatians 5:22-23) you are seeing God at work. God IS love, and He is kind, gracious, and just, so whenever you see those things in the world, you are getting a glimpse of His character, and it gives you fresh reasons to be grateful. We’d like to encourage you to cultivate the discipline of gratitude in your own life, in all circumstances. Look for God at work all around you and write a few things down each day. You won’t regret it.